Um... I'm kind of known for being organized. 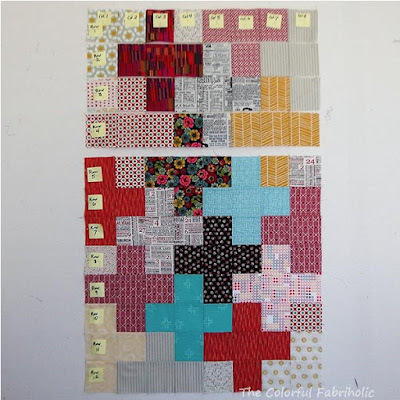 While at STLMQG's retreat a couple weeks ago, some friends noticed how I had a Plus quilt all kitted up and prepped for piecing, and how easily it went together with all the patches in the right places. They asked, and I gave an impromptu demo about how I prepped and organized everything, and how I kept it in order while sewing. I mentioned this in the blog afterwards and asked if anyone was interested. The response was positive, so here's the story of my organization method. In order to create this post I raided my scraps and cut patches for a 24" x 36" Nurses for Newborns quilt. 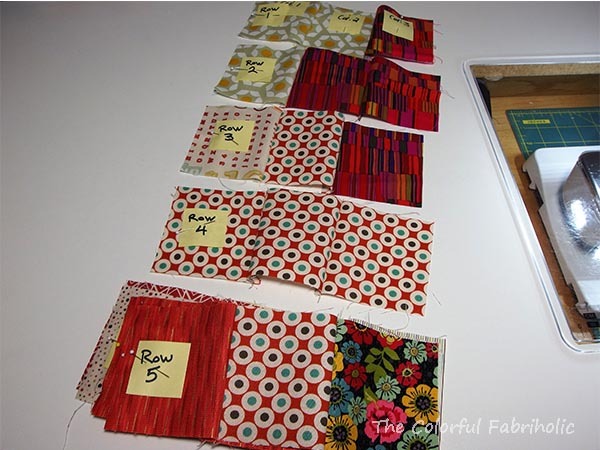 The small size enabled me to do it quickly; many of the patches were already cut, left over from past projects. Here are the patches laid out on the wall, 8 columns and 12 rows. What I realized while prepping for this post is that I am a creature of habit when it comes to piecing. I have particular ways that I use consistently, for taking the pieces off the wall, aligning them for piecing, and re-stacking them to keep them aligned. My method works for either patches like in this one-patch quilt, or for blocks. If I'm working at home and can leave everything on the wall until I'm ready to sew it, I just put a safety pin in the upper left corner block. If I'm kitting up a project, I label the columns and rows. The few minutes it takes to do this pays off in smooth going later. Starting with the left column, I take all the patches (or blocks) off the wall from top to bottom. I lift up the top one, place it on the second one, lift them both, place them on the third one, and so forth down the column. The result is a stack that's in the same order and oriented in the same direction as the patches were on the wall from top to bottom. When I'm sewing at home I do this for the first two columns, then for each additional column as I'm ready to sew it. When I'm kitting up a project, I stack each column as described above. 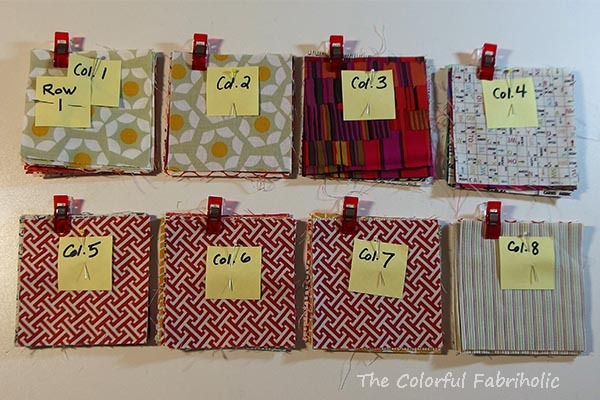 I clip the stack together with the clip at the top, so I'll know which way is up when I'm ready to sew them. I didn't realize I had made such a habit of this, but it definitely works for me. 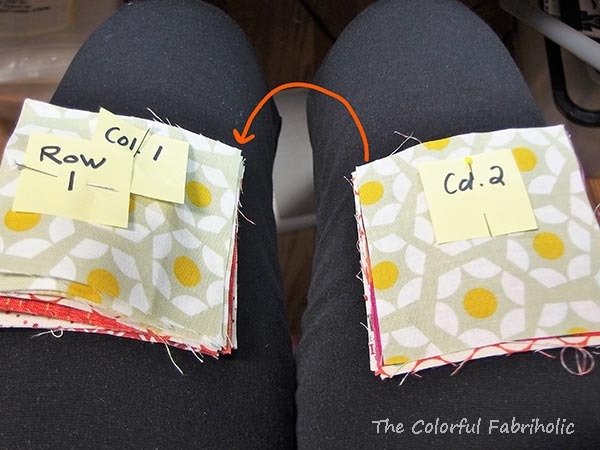 When I'm ready to sew, I place the stack for the left column on my left thigh and the stack for the next column on my right thigh. Another habit that works for me. Here I've removed the clips for sewing. I flip the top patch on the right over the left, like turning the page of a book, so the patches are right sides together but still correctly oriented. 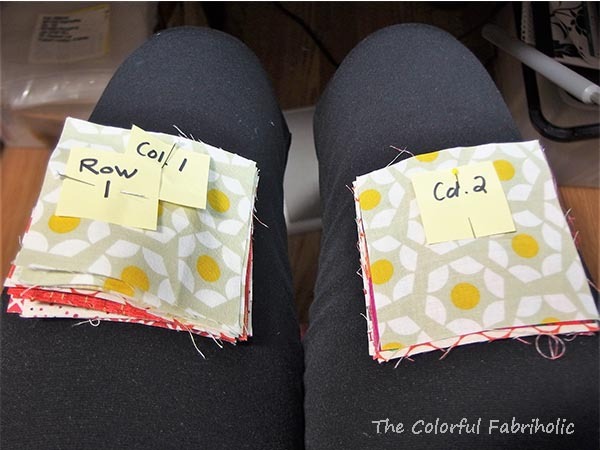 Once correctly oriented together I can align them for stitching. Sew, repeat for the second patch in the stack, etc., chain piecing until the entire stack is sewn. 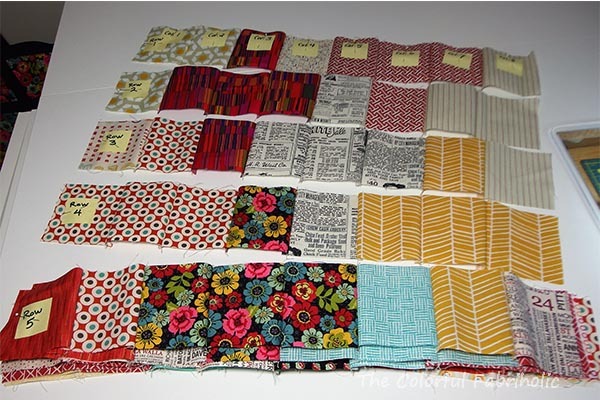 The bottom of the stack is the bottom row of the quilt, and is the last pair sewn. When I cut the chain piecing apart, I place the second-from-the-bottom on top of the bottom pair, etc. This results in a new stack that's in the same order from top to bottom as the pieces were originally on the wall. This step is critical to keeping everything in order. I continue in the same manner for the next stack. ... and restacking the rows from the bottom up as I cut apart the chain. Continue until all the stacks have been done. As the rows become longer, the stack on my left thigh drapes down to the floor. This method works for assembling rows of blocks as well as individual patches. The rows are done but nothing has been pressed yet. 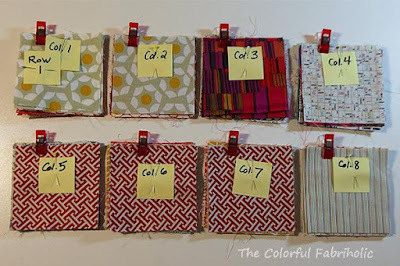 If I'm working at home and the rows are not numbered, I put them back up on the wall so they don't get out of order. 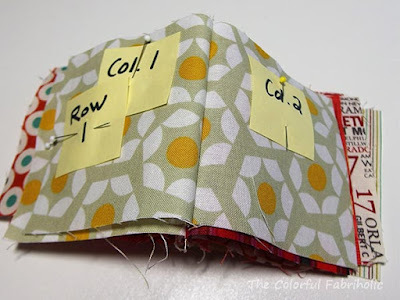 I'm in the habit of pressing odd rows to the left and even rows to the right, so the seams will nest. If the rows are not marked, I stick a pin in the far left of each row so I don't get the row turned around while pressing. I press each row as needed and either put it back on the wall or use it right away. Another habit - I start at the bottom. 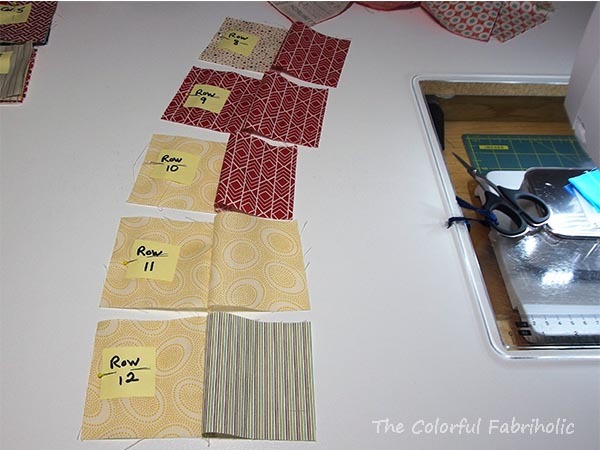 The reason for this is that it's really easy to flip the next row down over the bottom row and align it for sewing. 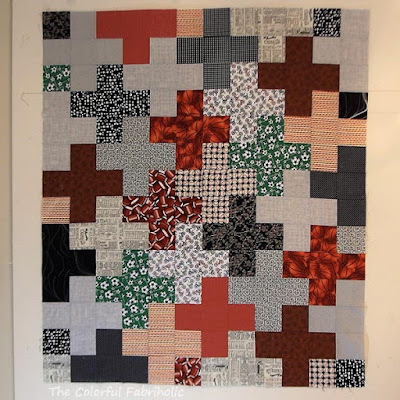 As more rows are joined, the large bulk of the quilt top grows upward, but it's still easy to flip and place the next row. 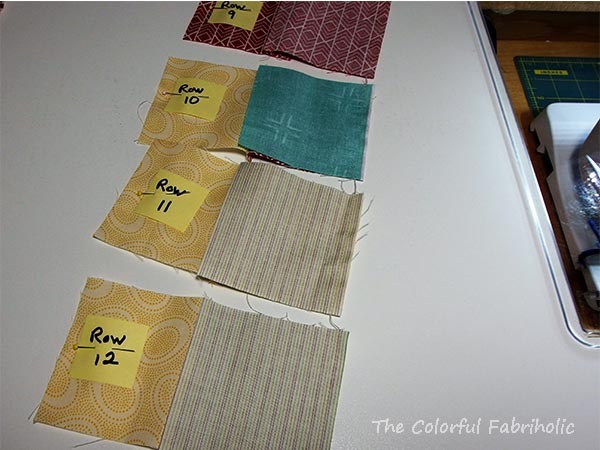 Here the bottom 8 rows have been pressed and sewn, and the remaining rows have not been pressed yet. A few more row seams, and soon we have a finished flimsy! 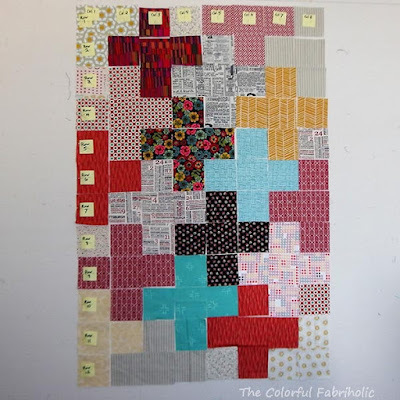 I did not realize until planning and writing this that the things I consistently do while piecing are actually habits that make things easier for me. 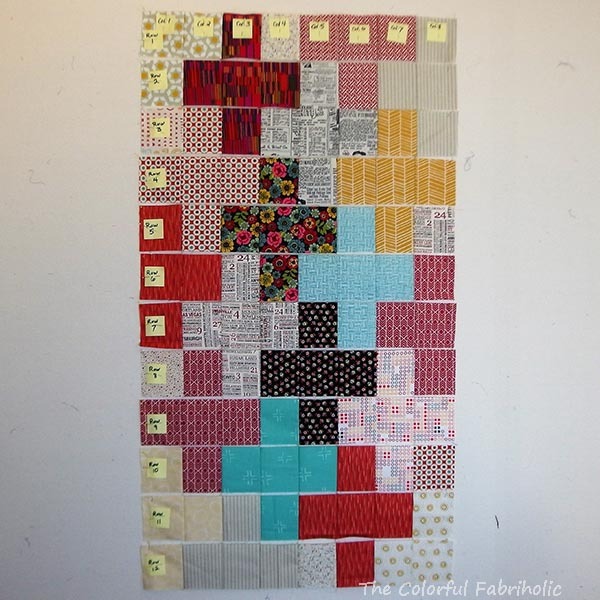 What quilty habits work for you? Thanks for sharing your methods! I always number and stack my blocks the same way as you do, though I go in horizontal rows rather than columns. I usually sew two rows at a time, first sewing the first two blocks of each row together, then while the second pair is still under the needle, I clip the thread between the two pairs, add the third block to the first row, clip the thread to free the pair from row 2 and add the third block to that row and sew on. 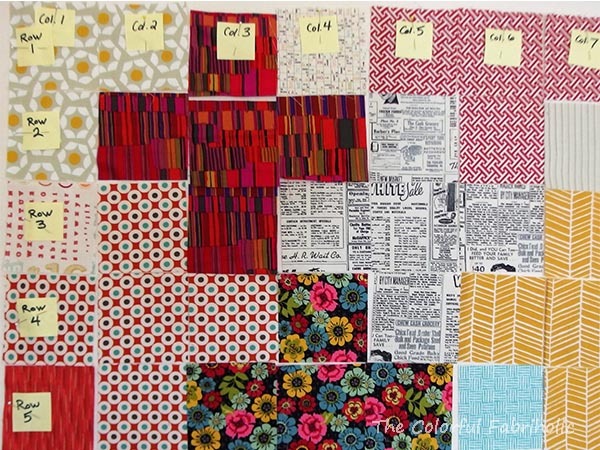 In no time I have those two rows finished and then I move on to rows three and four, etc. I press all of the rows at the end. 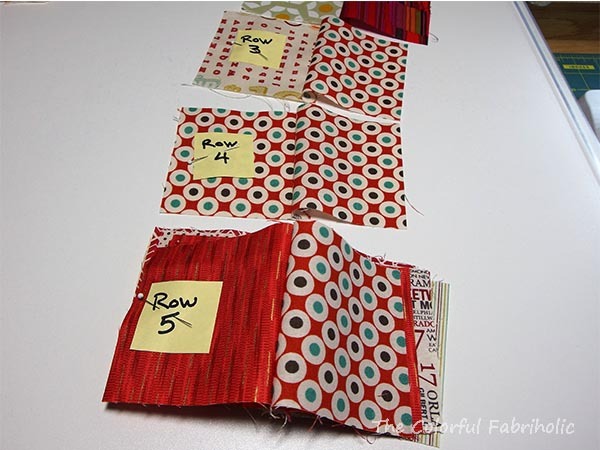 Then I join the rows into pairs, join the pairs into sets of four and so on until the top is finished. Funny how we get into certain habits to make the process easier, isn't it? This is a fantastic photo tutorial of your method. I agree with Leanne in that I tend to sew my rows together first. I do tend to break things up with ironing a lot more; I like to get up and move from design wall to machine to ironing board to design wall. Something about standing in one place for a long time pressing just makes the process more difficult for me. Being fairly newbie, I love chain piecing, it just hasn't been a good fit for me, I will refer to this tutorial. Over the years I pick hints up, just have never had a whole game plan to follow, this will really help me, so "Thank you!" I pretty much do the same as you, since I am working at home I don't put markers on, but I should perhaps! Thanks for the excellent tutorial! I tend to work in rows, not columns. 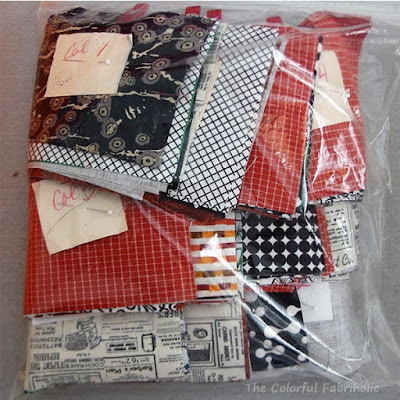 I think I will have to try your method out though, especially when I am sewing away from home and can't just leave everything laying out on my design bed. I will be saving this post for future reference. Hmm! VERY good information there! You should probably start a monthly feature of with organization tips! Thanks for this step by step tutorial. So many tell you to do thing but don't really explain why they do it. So thank you! Being organized and consistent seems to be the key to limiting mistakes. My system is pretty similar to yours. Having a design wall is so helpful in keeping things straight. Thanks so much! 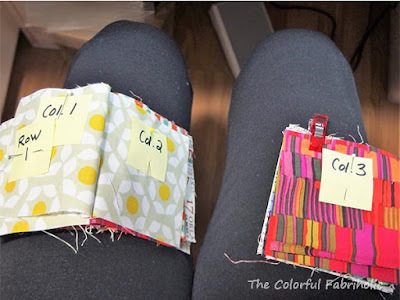 I especially love how you use your legs as an organizational tool--genius!